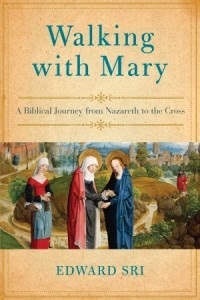 January's selection for our Catholic Book Club is Walking with Mary: A Biblical Journey from Nazareth to the Cross, by Edward Sri. I thought it was a great title for a month that begins with a solemnity dedicated to Our Lady and includes so many interesting feast days of saints devoted to her. A theme! This is a much more serious spiritual book than I usually read. I may in fact have spiritual ADD, I just have such a difficult focusing on books that contain more academic writing about such topics. I'm happy to report that this book kept me interested, despite it being a very scholarly and well researched source. My favorite thing about this book is that it is set up chronologically as a look at the major events in Mary's life. It made her seem very "human," which of course she was, but we so often see her saintly countenance in artwork that it's easy to forget that she was (in most ways) just like you and I during her earthly life. The author begins with some background information about Mary and the time and region that she lived in, including her betrothal to Joseph and things that we can surmise about her family. *Extremely* interesting historical information, much of which I had not known. Dr. Sri's chronology mirrors specific mysteries of the Rosary (very lovely), and begins with the Annunciation. He draws heavily from Scripture as he writes about Mary's response to the angel Gabriel and what this meant for her future. We also read about the Visitation, and then Mary's journey to Bethlehem, including some fascinating information about the Roman census and what this meant for her and Joseph. Next, we explore the Presentation in the Temple, and Mary's likely sickening realization that her motherly heart was going to be broken beyond repair sometime before her death. The chapter on the Finding in the Temple is particularly fascinating, examining how such a seemingly embarrassing incident was the only event from Jesus' childhood recorded in Scripture, and how it could have easily happened given the customs of the time. The final chapters of the book address Jesus' miracle at Cana, the Crucifixion, and Mary crowned in glory as seen in the biblical book of Revelation. I really enjoyed the way that Dr. Sri approached this topic, and learned a great deal not only about Our Lady, but about the history and customs of that time period. His knowledge of Scripture is solid, and there is a tremendous opportunity within this book for in-depth study of the passages he cites. In fact, this would be an outstanding book to tackle as a Bible study over Lent. I would recommend the book to anybody wanting to learn more about the Mother of Jesus and the reasons why the Catholic Church views her in such high esteem. What did you think of this book? Leave me a comment! Ok, so January is a wrap! For February we will be reading The Hidden Face of St. Therese, by Ida Friederike Gorres. Great Lenten preparation! Lent doesn't start until March this year, so major prep work in February. Join us! Congrats on you Sheenizing Nomination!